So ever since the thread asking about Bulma, I've been slooooowly working on getting some projects together, mostly just trying to figure out the Xenoverse/Xenoverse 2 file system. I've set aside work on Bulma and Chi-Chi for now (Bulma's model has been ripped, but I need to figure out CaC pieces for Chi-Chi since she isn't physically in the game), and have switched gears to working on someone a bit... older. Super Kami Guru himself. I've seen some really good statues of him, but most are either too big for my taste, too expensive, or some combination of the two. It's also the sort of character 3d printing is best suited for, so I figured I'd give it a go. 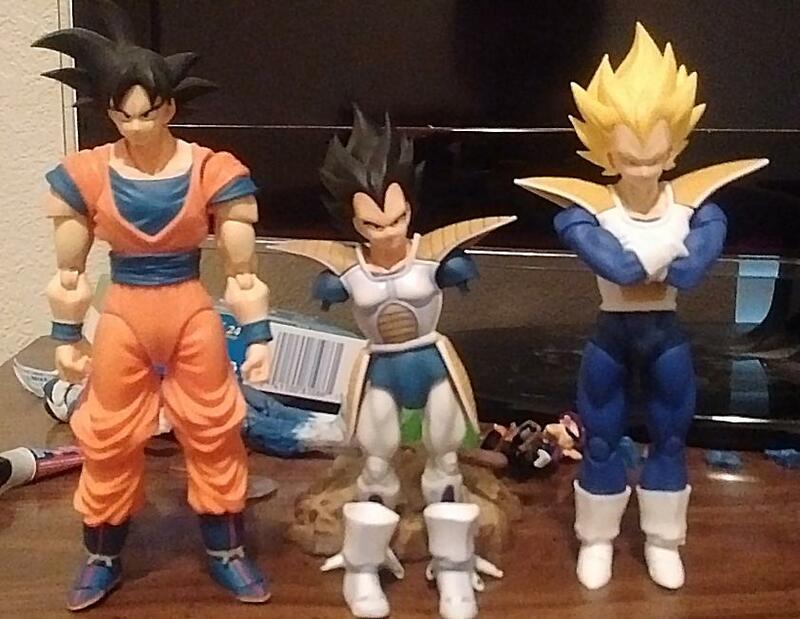 I'm purposely making my version a bit on the small side (I'm shooting for about 8 inches tall) so it's probably more suited for a 5 inch shelf than the Figuarts line, but even that'll make him taller than Piccolo/Nail, which is all that really matters to me. I'm currently in the process of making the model one solid piece so I can hollow it out. As it stands, the solid model would cost in the $500-1000 range depending on what service I use for it, but considering how bulky it is, I think once I hollow it out I can get it to ~$100. That's still expensive, but it's still cheaper than the 15" resin statue which seems to run in the $250-350 range. A couple of updates as to what I'm up to: First of all, I've more or less dropped Guru for now. Even pouring hours of work into him was not sufficient to accomplish what I wanted, and I really have no use for him without a Big Green figure anyway. Plus, even at 8 in tall he'd still just eat a ton of shelf space. I may revisit that project down the line, but for now it's being shelved. Second, I had been told about a decent Chi-Chi hair, but turns out it's actually from her Super/Buu saga appearance rather than her Cell saga one, so that one is also on hold, at least for now. 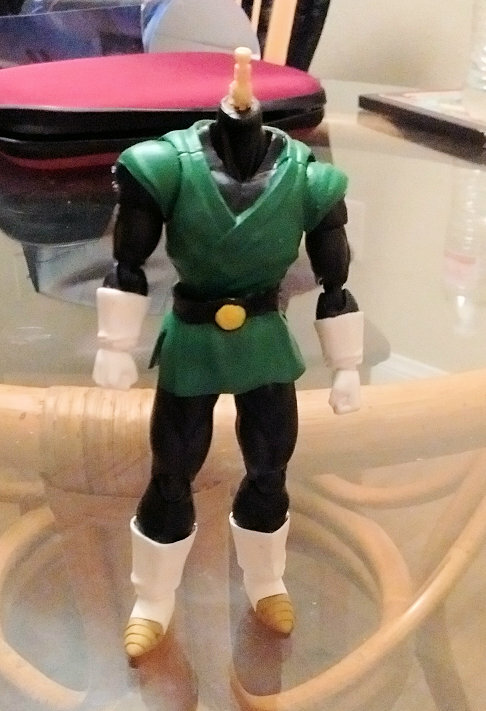 On a more practical custom figure note, I posted this pic in another thread, but it's a WIP for Great Saiyaman Gi Gohan (no mask). I won't be able to finish this one until I get to steal Ace's head, but once my Resurrection F Goku comes in I'll at least finish getting the body ready. So I mentioned wanting a Super Kami Dende over in the figuarts thread, but I specifically wanted the more teenage Dende seen during the Buu saga. 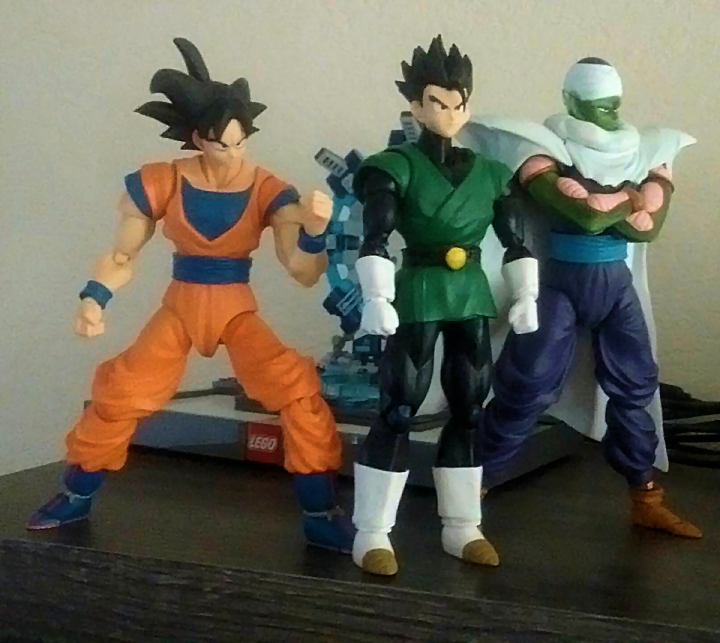 A good chunk of my shelf does or will come from that era of the show, and having an teenage/adult Gohan with a kid Dende just feels wrong somehow. I'm still working on the teenage model, but I did want to get some input on this one while I'm still working on it. Mainly, I'm trying to decide how I want him posed and what expression to give him, and any input would be helpful. 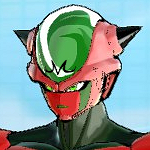 I should also note that the head I'm using will probably not be staying (It's currently Nail's, since that was the base for my mesh) and I'm going to go into Xenoverse's CaC menu at some point soon to see if I can find a younger, less Warrior head. Yay, prepared this one before work so I can actually upload it to an image site instead of having to attach it. There's still stuff to do here, but we're getting there, at least from the outside. I've got to fix the hands (I had to revert to a previous save at one point and forgot to re-rotate the end of the fingers), fuse some pieces together, and do a ton of work internally, but I like how it's shaping up. I'm taking my time with this one, connecting everything by hand before I try to hollow it, whereas I floundered with using booleans on Guru for ages. do you have a 3d printer or are you gonna use one of those upload sites? 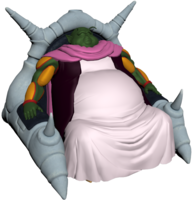 i had a flashforge dreamer and the prints were great quality but the build size was only 9x6x6 so you never wouldve been able to print guru, you could do the 5' dende. but for 500-1000 you could buy a good 3d printer and print your own, and decent fillament doesnt cost much. I've looked into getting a 3d printer a few times, the biggest issue for me is that I do a lot of full color sandstone statues, which require something a bit more substantial than I can ever afford. It's not viable at the moment, but it is something I would like to do eventually. So this one's going to sound weird, buuuut... does anyone know of an articulated final form Freeza or pre-transformation Cooler that is just a bit too large for figuarts scale? As in, somewhat larger than Figuarts 16's height aka 6-7"? I am vaguely considering trying to come up with a "final form" King Cold to match his sons. Well, the Figurise Model kit Frieza is a bit too big for Figuarts and has the same level of articulation. I am actually seriously considering that one, but I worry it's still a bit small for Cold (though I might see if I can supplement it). in my mind, even in perfect form, Cold should be at least Cell's height. Honestly though, the articulation isn't AS big a deal... I'd be ok with Jakks articulation, it would just make things easier to sculpt over if I can pop some of the limbs off. At the moment, I can't think of anything that isn't a statue that would be bigger... but someone else here might know something. 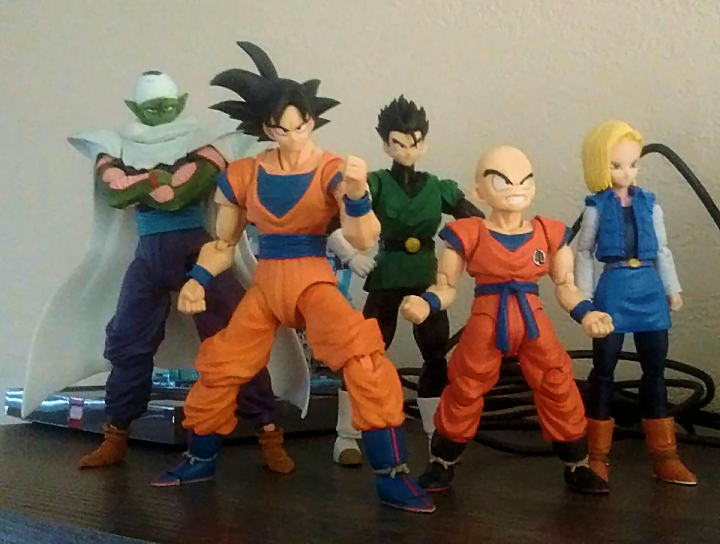 My scope of DBZ figures is pretty limited. 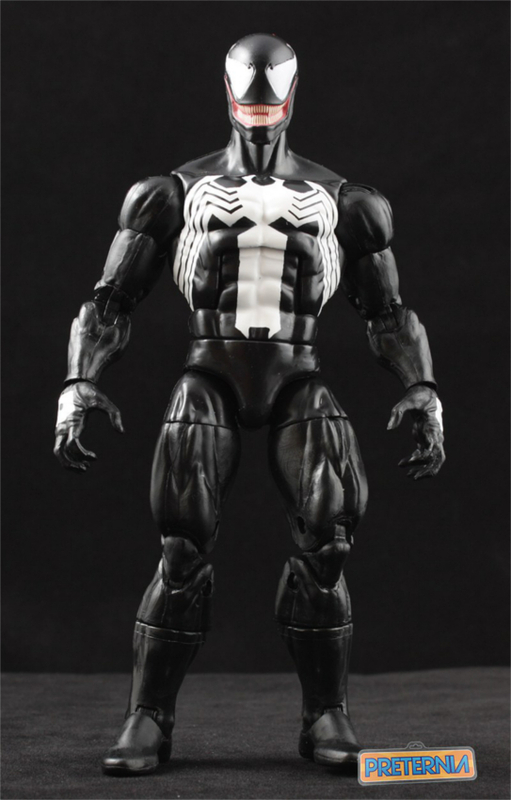 ...then this Marvel Legends Venom might be a good choice. It was released last year so it should still be easy to get. There will be two significant issues though, resizing the joints so they can be repainted and figuring out how to deal with the shoulder sections, which will be quite difficult if you plan on keeping the articulation. 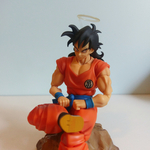 It's an interesting idea, but I've always been reluctant to cross pollinate custom figures from different styles, especially with Toriyama's super specific style. I'm not even that fond of ML customs that use Wrestling figure pieces, even though both are made from the same company using mostly the same bits. I'm not entirely dismissing the idea, mind you (though anti-venom might be the better option as a base because he's already white) but before I jump to that I'd like to try subbing a few pieces from the Figure Rise Cell (who has even greater height than his Figuarts counterpart) in with the pieces from Freeza and see how that looks. Worst case, I can try combining elements from all 3 together. 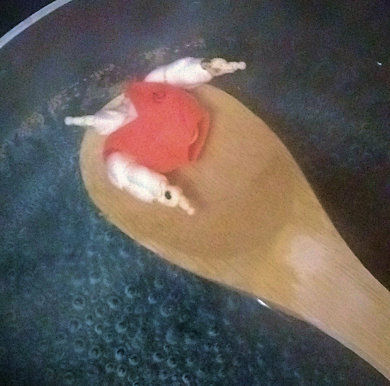 Didn't take too many pictures as I was working, but having to cook Goku to get his upper arms off struck me as funny for some reason. I went on to add some superglue to the arm joints to fill the empty spaces, drilled a larger hole in the torso connector, sculpting the belt additions, and finally adding some sculpt to the connector piece because I accidentally dremeled through the center. And here's where I'm standing, mostly. 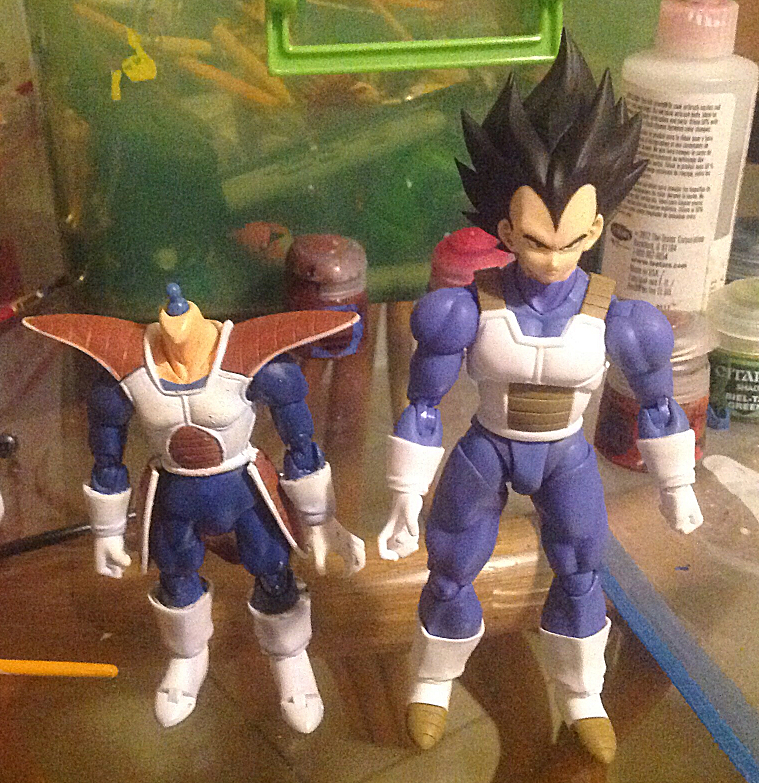 There's a few things I want to touch up before I finally get to add Gohan's head (planning on using Ace's) but a good chunk of that relies on the connector bit drying. Regarding Dende's height, there's some pics here and such: aminoapps.com/page/anime/1815114/dragon-ball-z-battle-of-the-gods-a-few-things-that-annoyed-me I haven't ever noticed his inconsistent height or paid attention I guess. I am more of a fan of early DBZ than late, so I don't analyze Buu Saga. The pic on there with Goku is from the end of DBZ though isn't it? Isn't that several years AFTER Battle of Gods took place? I might be wrong. 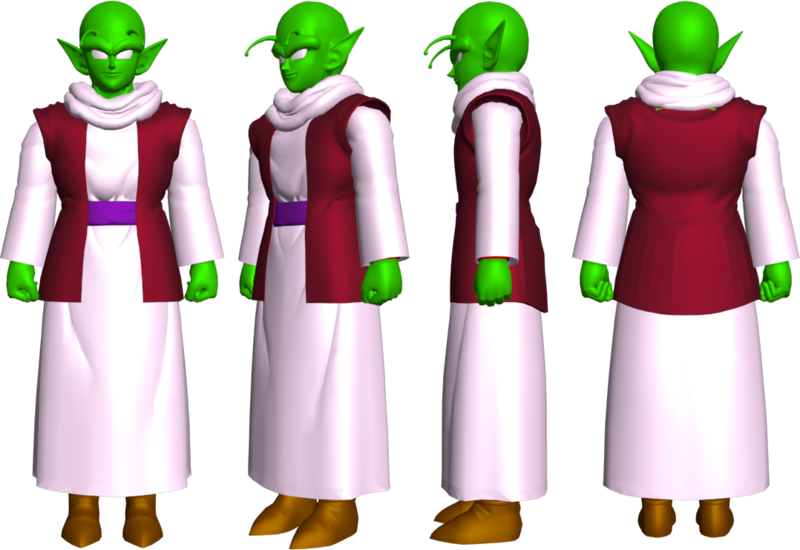 Make sure to rotate Dende's feet to point slightly outward! It's super cool to see someone customizing via 3D models. I don't know of any Cooler figures in the size you're asking for. There's probably a Frieza but I dunno. The Great Saiyaman is looking good! So I went ahead and picked up the Figure Rise Freeza (I'd seen it at my gamestop a few weeks ago, and if nothing else I like making model kits anyway) and I've ordered Cell... once he's delivered I'm gonna play with mixing them both together, see what pieces can be subbed in where. So long as the result is decently big, I'm ok. I'll probably wait and come up with a design once I have all my pieces together. 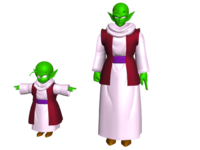 -Dende's height fluctuates from episode to episode and from shot to shot. 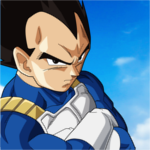 For example, the Buu saga scale I've seen floating around here a few times (which features Dabura, Supreme Kai, Bibidi, and Gohan in the all black bodysuit from the Dabura battle) has him clearly taller than Popo and Krillin, there are multiple shots of him and Popo standing side by side in the anime where he's taller (one specifically comes from the two watching Buu's Human Extinction attack) and there's bits of him where he's hanging out with Mr. Satan where he's shorter, but not quite Krillin short. Then, by contrast, I can find very specific group shots from both the anime and from Toriyama from after the kid Buu fight where he's not only shorter than Popo, but is suddenly Kid Trunks' height. In the end, it's just too inconsistent and I don't care to follow it. He'll be as big as I want him. -Doing the 3d printing thing has been a hobby of mine for awhile now. I've done a bunch of smaller bits, such as a couple Lego bits for Clayface and Scarface (to match the original Lego Batman game), a bunch of AI to go with my Mega Bloks RvB customs, and a TON of full color minecraft prints. I've been both customizing figures and doing 3d models for game mods for over a decade, so for me 3d printing has always been just a natural offshoot of what I was already doing. Ace figure arrived yesterday, so I finally finished my custom Gohan. Kinda working on a 2.0 Trunks based on the Ace body as well, but I also do like TP Trunks so I'm also not as motivated. So I'm not dead or done with customs. 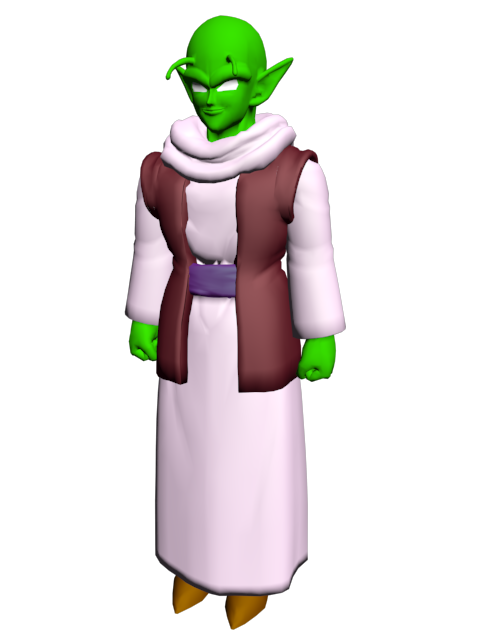 Ran into a lot of issues behind the scenes with Dende's model, but I've got it mostly worked out now. Because he's such a low priority character I'm not going to be printing him for awhile yet (especially not with figuarts eating my action figure money with so many good releases in a row) but the model is basically ready to go whenever I am. Meanwhile, I've also been doing some work on making a custom Tarble. 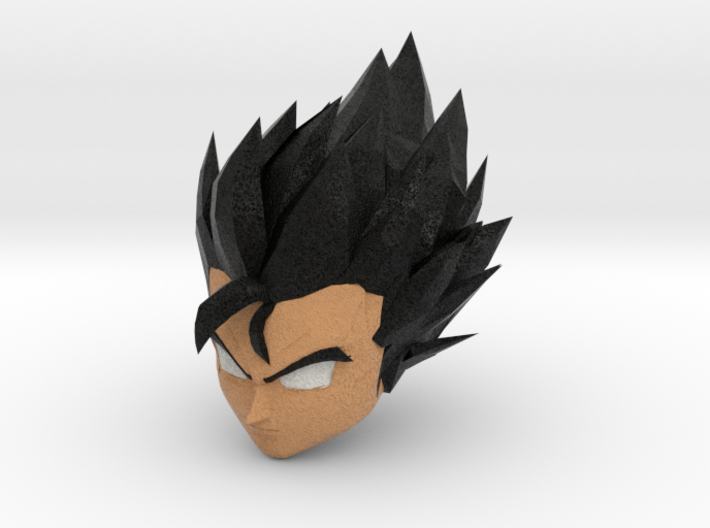 However, because I'm already using the "Ace" head for Gohan, I decided I'm instead going to print my own just to give him a little differentiation. I've already ordered a set of different sized test heads so I can make sure the final one fits best on the figure, then I'll order the final print in a better material. As I mentioned in the bootleg forum, I'm planning on using Freeza limbs, so I took a quick snapshot of my custom borrowing my primary Freeza's legs. 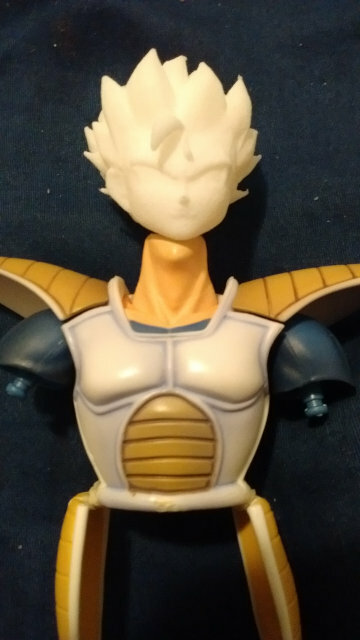 I also just started some early work on my custom final form King Cold using the figure rise Cell, but the biggest hiccup I see is... well, the feet. My original hope would be that the figure rise Freeza feet would be close enough in size I could jury-rig them for Cell, but they're nowhere close. 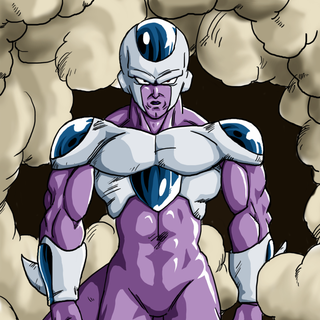 Does anyone know of a flatfooted Freeza/Cooler/Cold statue or something in ~7" scale that I could get relatively cheap? Majin Tomato Tarble is coming along nicely, I almost did the same thing but I had first form Freiza in mind. So my prototype heads came in for Tarble. This is the size I ended up using. Going to reprint it in a better material once I get paid Thursday, as well as a Bulma for later use. Waiting for the head still, but I am so happy with how he's come along. I'm loving the 3D printing, there's so many possibilities there. Also good on you for giving Tarble a chance, I love that little Saiyan dweeb. Can't wait to see it done!